This one looks much better than most, even highlighting itself with the phrase SECURE. Again, it gives itself away in two obvious ways: first, the FROM address ends in NO-REPLY.COM instead of something with AMAZON in it, and second, the link under CLICK HERE is nothing to do with AMAZON, either (GOO.GL?). 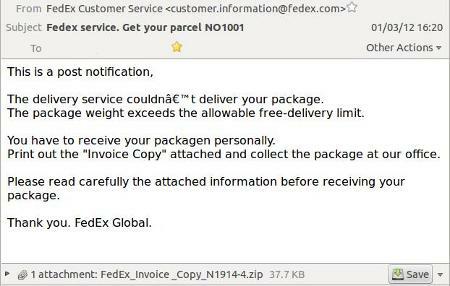 ...which is very unlikely to be a FedEx website. There are a lot of guides out thereabout viruses, trojans, rootkits and other malware. Many are worth reading and heading. This set of articles outlines some of the common traps we've seen in the Broadway area over the last few years and how they can be avoided in the future. Make no mistake,every example cost area businesses both time and money... sometimes,quite a bit. As an aside, if you need professional assistance and support with your technology, ring Permutation at01386 576112 or drop us a line, here. Years ago, before "pop-up blockers" were standard parts of web browser software, there existed a fantastic* scam. To foster more advertising revenue,browsers allowed certain websites to toss little boxes up on your screen, over the top of everything else you were watching. So,someone figured out that virus protection software like McAfee and Norton did the same thing when they detected a virus. 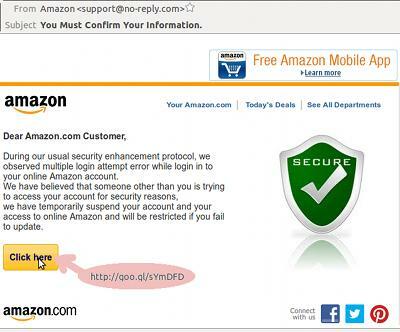 Scammers modified the web “pop-ups”to look like anti-virus ones. The catch, if you clicked on the“pop-up” you authorised your browser to infect your PC... and because you authorised it, your actual anti-virus software could do nothing about it. The headline above says it all...neither your browser nor any website can detect the state of your PC.If you see it, it's a scam... so avoid it. How Did UPS / RoyalMail / FedEX Get Your Email Address? This happens all year round, thoughit's most common around Christmas, Valentine's Day and (American)Mother's Day. That's when the highest percentage of the Western world will miss postal deliveries. Now this is one of many “baits”(more to come), but “hook” most often is an email attachment. While it is possible for images (specifically, files ending in JPG or JPEG) or Microsoft Word documents to contain viruses, this scam usually used a compressed file (ending in ZIP) containing an executable program (ending in EXE). Victims open the attachment, then double-click on the EXE file contained within. Again, because you've chosen to RUN the file, you have effectively told your anti-virus,“hey, don't worry about these guys, I trust them.” Once done,this type of infection can be very difficult to remove. 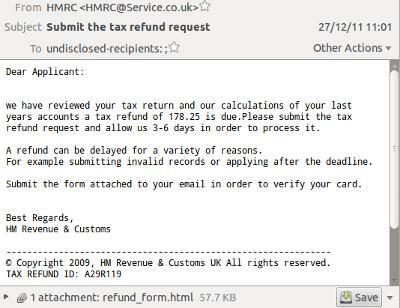 It's From HMRC... Wait, It's Not To Me! Another tell for email scams is the"To" field. 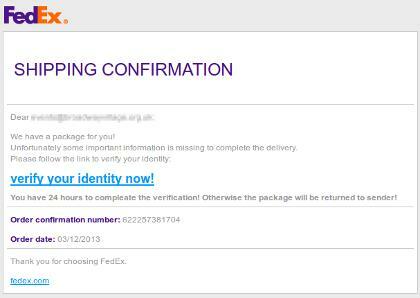 If it doesn't contain your actual email address,there's a good chance that it is a scam. In essence, the email was sent out to a large number of recipients with emails in the BCC(Blind Carbon Copy) field. It hits the maximum number of potential victims, yet still appears quite personal. This specific example, even more than the last example, relies on the “most common characteristic” con. If some aspect of your email identifies you as in the UK (e.g. @btinternet.com, gmail.com with UK selected on your country profile,anything containing .co.uk, etc. ), then odds are you have some dealings with HMRC. Like all of these scams, it's a numbers game. There are a lot of ways bad people try harm people... particularly small businesses. We will try continue how these things work, and how to spot them, throughout2014. The bottom line is always to stay attentive, stay sceptical and stay alert. Everyone worries about surviving a business disaster, but luckily, most are never put to the test. Late June, lightning struck Permutation Company's telephone line, setting off a cascade of electrical damage affecting every router, switch, desktop and printer throughout the office. Client machines sit behind a set of industrial filters (and were unharmed), but just about everything else was turned to scrap. What might have been a business-ending event was merely an annoying inconvenience, as all data was backed up in real-time. Additional networking equipment (stored on site) was immediately deployed and key information was copied onto spare laptops. The biggest inconvenience was the lack of a phone line and Internet connection, so those functions were tethered through an Android mobile phone. It was slow, but manageable. We were up and running quickly... only to experience the much more painful task of managing our service providers' help desks! Bottom line... having a good plan and the right equipment means the difference between irritation and catastrophe.